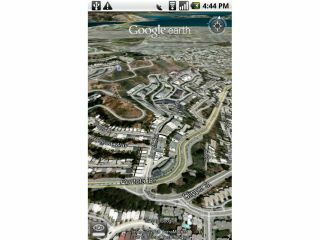 Google has finally popped out Google Earth for Android mobile owners - but only if you're using a certain version of the system. The new service is only available for those with Android 2.1 phones - which at the moment is only the Nexus One, and that's only available in the US right now. "With a 1GHz processor, advanced 3D graphics, and Android 2.1, Nexus One packs a lot of performance in a thin package," said Google on its official blog. "Ever since we got our hands on one, we have been putting it through its paces, drawing complex scenes of 3D imagery, terrain, roads, and other layers, and Nexus One never misses a beat. "Now that we have put the final touches on the app, we are happy to announce that the latest member of our family is ready for the world -- Google Earth for Android. "This is our fastest mobile version of Google Earth yet, with a smooth framerate and a beautiful 800 x 480 screen." We're not sure whether other devices that get upgraded to Android 2.1 - like the HTC Hero or Motorola Milestone will have the same level of depth as the Nexus One version. However, the iPhone, which is a less powerful device than the Nexus One, has been rocking Google Earth for a while now - so at least we know the platform works. If and when you're an Android 2.1 user, head on over to the Android Market to download it.